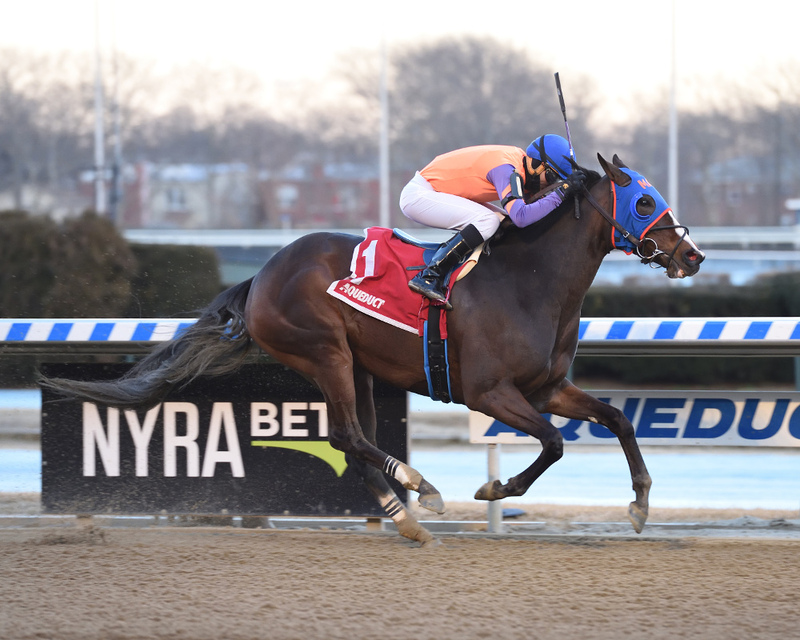 Frostie Anne by New York sire Frost Giant has become something of a handful for the assistant starters behind the gate but was all business as soon as the starter sprang the latch on the $100,000 Biogio’s Rose at Aqueduct Racetrack Sunday. After taking a decisive lead by the first point of call, the 6-year-old mare completely owned the one-turn mile for older New York-bred fillies and mares. By mid-year 2018 Frostie Anne was in peak form for trainer Rudy Rodriguez, who co-owns the mare with Michael Imperio. She compiled a six-race win streak which was bookended by victories in the open Sis City Stakes at Aqueduct on March 31 (at the same trip as the Biogio’s Rose), and the 9-furlong Saratoga Dew Stakes at the Spa on August 17. In the fall, however, Frostie Anne’s form tailed off. 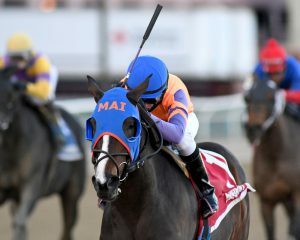 Despite placings in the Staten Island Division of the NYSS series and a $16,000 starter’s allowance, she threw in a clunker in the Empire Distaff in October and finished a no-excuse fifth in the Bay Ridge Stakes on December 30. Sent off at odds of 9-1 on Sunday, the dark bay put her struggles behind her. At the bell, it was Bonita Bianca, dominant winner of last year’s Empire Distaff Handicap, who got a jump on the field, but Frostie Anne charged up rail from her inside post to take over, and quickly led the way by more than two lengths. Unpressured, Frostie Anne carved out early fractions of 23.35 and 46.51 with Bonita Bianca still on the chase. Navigating the turn smoothly, she remained firmly in command at the quarter pole as six furlongs went in 1:11.21. Six lengths back, the imposing Midnight Disguise (2-1), returning from an eight-plus months’ layoff, was getting her large frame into gear for a closing bid. Completing the order of finish were favorite No Hayne No Gayne, Playinwiththeboys and Frosty Margarita, who is due to retire the breeding shed after this race. Unbridled Adventure was scratched early in the day and, unfortunately, contender Split Time flipped in the gate and had to be a late scratch. The incident also delayed the start of the race and forced Frostie Anne to undergo the rigors loading into the gate twice, which she does with a blindfold. As a weanling Frostie Anne sold to Fergus Galvin for $18,000 at the 2014 Fasig-Tipton Fall mixed sale. After making her first six starts for Galvin and partners, including breaking her maiden at the $20,000 claiming level, she was claimed for the first of five times (twice by Garry Gullo for Unqua Stable). Rodriguez picked her up for a $25,000 tag in December 2017. In 12 starts for the Rodriguez barn she has won six races, including three stakes. Bred by Mr. and Mrs. Grant L. Whitmer and foaled at Keane Stud in Amenia, Frostie Anne is one of four winners from four foals to start out of Lake Toccet by Toccet, an unraced New York-bred half-sister to turf stakes-placed Irish Princess. Lake Toccet is also the dam of Freudie Anne by Freud, a multiple stakes winner of nearly $400,000. Lake Toccet has juvenile colt by Giant Surprise and a yearling colt by the same sire. She was bred to Freud in 2018. Frostie Anne has now won five of nine starts at the one-mile distance of the Biogio’s Rose and five of 12 races at Aqueduct. In 36 career races in all, she has compiled a record of 14 wins, four seconds and three thirds and earned $528,063. NYTB is the official authorized representative of the Thoroughbred breeding industry in New York State; the unified voice of Thoroughbred breeders in the State of New York for purposes of communicating the advantages and rewards of breeding Thoroughbreds in the State and for the purposes of conducting and coordinating activities with breeding and racing associations and agencies.